Just as with any fruit that has that tangy taste, you can be sure that pineapple packs a good punch of vitamin C—a single cup of it offers well over your daily requirement. Pineapple also contains bromelain, a protein digesting enzyme. That makes it a good meat tenderizer, but as the University of Maryland Medical Center notes, bromelain has also been used to reduce swelling after surgeries and with infections. Some research also suggests that the enzyme may be as effective as ibuprofen and naproxen in reducing the pain of arthritis. Find out about Why Pineapple Earned the Name “Excellent Fruit” here. Cucumbers, like many other vegetables, has cancer fighting properties. They contain phytonurtients and polyphenols that have anti-cancer properties and help lower the risk of breast, uterine, ovarian, prostate cancer. Cucumbers are also low in calorie, helping boost healthy weigh-loss. 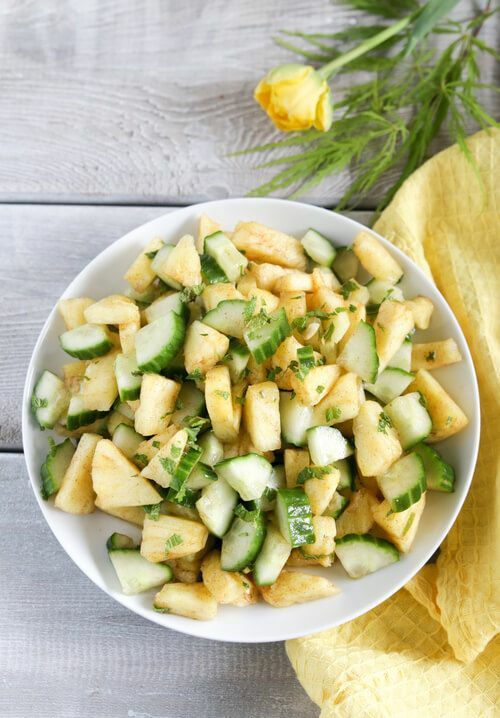 Combine pineapple, cucumber, mint, and cinnamon together.